Is Raw Salmon or Cooked Best for Losing Weight? Salmon is the second-most popular fish in the United States, according to the University of California Cooperative Extension. Thanks to improvements in fishing and agriculture, both fresh and frozen salmon are available year-round. In taste studies comparing wild and farmed fish, the wild-caught version does not always come out ahead. Salmon has many health benefits. It's rich in nutrients and very low in calories. Cooking raw salmon does little to change the calorie content. Salmon may be known as a fatty fish, but it's not the same kind of fat found in processed foods, fast food or in red meat. The oil in salmon is a polyunsaturated fat, or PUFA, which is mostly found in plant-based foods and oils. The Mayo Clinic reports that eating a diet rich in PUFAs can improve blood-cholesterol levels and decrease heart-disease risk. Unlike saturated and trans fats, which should be limited to less than 7 percent of your daily caloric intake, healthy fats like PUFAs can make up 25 to 35 percent of your daily caloric intake. Cooking salmon does little to change the caloric content. One oz. of raw salmon, such as the kind used to make sushi, contains 58 calories. Sockeye salmon, native to North American waters, cooked in a dry heat has 60 calories per oz. Where you can run into trouble are the ingredients you add to your recipe. One serving of nigiri, which is a piece of salmon on top of a serving of white, sticky rice, has about 68 calories. A full serving of salmon sushi, typically six pieces, may contain up to 400 calories. Broiling or grilling a 3-oz. 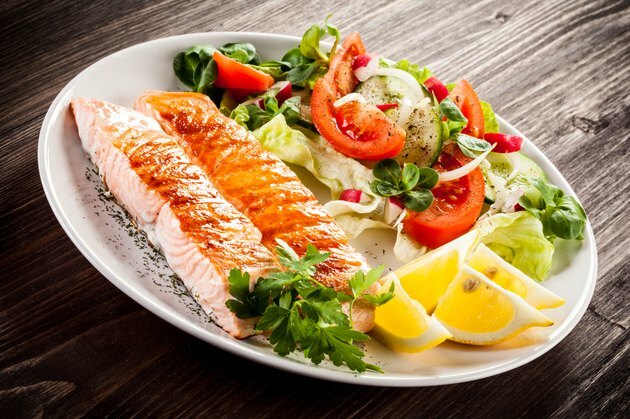 serving of salmon won't alter the calorie content, but the olive oil or butter you used to prepare the fish will. A half tbsp. of olive oil has about 60 calories. A half tbsp. of butter has about 50 calories. Slathering your fillet in these flavor enhancers ups your calorie intake of a 3-oz. salmon fillet to roughly 170 to 180 calories. The goal for many weight-loss diets is to limit calorie intake. Whether you choose to consume cooked or raw salmon won't make a difference. How you prepare your fish, however, can not only up your calorie intake, but increase the fat content as well. A 1-cup serving of sticky rice can have 169 calories and 12 percent of the recommended daily allowance, or RDA, of cholesterol, but no significant amounts of fat. A half tbsp. of butter has 50 calories, 18 percent of the RDA of fat, 36 percent of the RDA of saturated fat and 10 percent of the RDA of cholesterol. At 60 calories per half tbsp. of olive oil, you're also getting 21 percent of the RDA of total fat and 9 percent of the RDA of saturated fat. Based on these ingredients, the raw-sushi-and-rice combo will be more beneficial for your weight-loss goals. Eating too many calories a day is linked to being overweight and suffering from obesity. Rather than counting each individual calorie you consume, the U.S. Food and Drug Administration has a chart that simplifies what could be a grueling process. By sticking to these general rules -- that foods with 40 or fewer calories are considered low calorie, fewer than 100 calories are moderate and 400 calories or more are high -- you can prevent overeating. The American Heart Association recommends eating a 3.5-oz. serving of fish twice a week. You can avoid fattening up this naturally low-calorie meal by baking or grilling your fillet rather than frying it. Choose low-sodium, low-fat seasonings like spices, herbs and lemon juice in lieu of fattening ingredients.